The Mesa Creative Arts Center and The Mesa Healing Center - combining creativity, holistic healing, spirituality, art, Native American and other indigenous teachings, metaphysics, and education, is here to help you find personal growth and inner tranquility. Become part of a community dedicated to unconditional love, compassion, peace, and understanding. Take a look at what we have to offer to help you rediscover your true self. Your spiritual journey begins here! The Mesa Creative Arts Center. Our premier Spiritual Center, workshop, and gathering place for people who want to experience authentic relationships with themselves and others, heal old traumas, create art, make crafts, learn new things, and raise their vibration in a healing energy environment. Located in the greater Pittsburgh, Pennsylvania area, "The Mesa" is also the home of our Native American Medicine Wheel where we hold healing and celebration ceremonies. Classes. Including fine art and crafts, Native American philosophy, crafts, and life ways, Holistic and Natural healing arts, Practitioner training, Yoga, creative classes with spiritual emphasis, self-empowerment, and consciousness raising. The Mesa Metaphysical Store and Gift Shop selling spiritual, healing, metaphysical, and decorative items. Choose from our wide selection of candles, books, incense, Himalayan salt lamps and bath salt, sage for smudging, card decks, pendulums, jewelry, rocks and crystals, handmade crafts, and other things to feed your Soul. Also available are our own Tools for Energy, Transformation, and Healing, made right at The Mesa. Holistic and Spiritual Healing services from The Mesa Healing Center including Reiki, crystal healing, sound healing with Solfeggio tuning forks, Soul Retrieval, White Light spiritual healing, flower essences, seashell divination readings and seashell healings, psychic readings, space clearing, and wedding ceremonies. We also provide emotional, spiritual, and relationship counseling services. 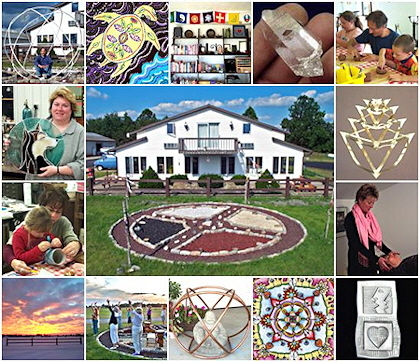 Creative, Healing, or Spiritual Retreats. Custom tailored packages of healing, creating, learning, Spiritual expansion, and relaxing are available for individuals or groups. Come for just a few days or a whole week. Programs for Spiritual Centers, Businesses, Schools, Libraries, Civic groups, Scout troops, or private parties. We can arrange programs for your organization or gathering at your location or here at The Mesa. Subjects include Native American topics, drum making/drum circles, crafts, releasing stress, Holistic healing, meditation for relaxation, wellness, self-empowerment, and more. We can arrange a children’s crafts birthday party, or a “ladies night out” of art, healing, or just good fun. Check out our Mesa Blog, “View From the Mesa” to read about our experiences in helping ourselves and others on the road to spiritual evolution. There you’ll find essays, stories, observations, and tips about personal healing, expanding your awareness, and walking a spiritual path written by Mesa Creative Arts Center Co-director, Brad Silberberg. Send Back Technique, a simple and powerful way to release habitual Life-Limiting beliefs and patterns of thought from our ancestors or past experiences and replace them with more fluid, dynamic, Life-Affirming ones. Heal yourself while simultaneously Sending that healing Back to all of your ancestors. Magical Thinking Healing, a fast, permanent, and profound method of healing blocks that hold you back in life. Locate the self-images that keep you stuck mentally, emotionally, and spiritually and change them using simple, imaginative, and impossible-to-fail “tests” to help you reassess yourself on a very deep level. New understandings achieved on the inner mind level reduce fear and anxiety, free your true nature, and attract better life outcomes. Sales of TC Energy Design glassware from Europe that uses the structural physics of Sacred Geometry to revitalize water, restore its memory, and improve its life giving benefits. Amethyst Bio-Mat sales, demonstrations, and healing sessions. We are authorized dealers of Richway Amethyst Bio-Mat products. Find out how the Amethyst Bio-Mat can help you. Our own Mesa Creative Arts Tools for Energy, Transformation, and Healing. Energy generating, receiving, and enhancing tools for promoting healing, such as Enspirels, Heliospheres (Gensa Crystals), Portals, Stained glass pyramids, and Singing Bowls. Fine art and crafts. Hand made sculpture, jewelry, paintings, ceramics, and more. Custom Blacksmithing work--(see our Gallery) including furniture, custom drawer pulls, tools, sculpture, fountains, architectural work (railings, gates, etc. ), and Feng Shui articles. Coming soon: Mesa Creative Arts Online Store where you can purchase our handmade art, crafts, Tools for Transformation, Energy, and Healing, metaphysical items, and other items directly over the web. Mesa Creative Arts, Inc. is a spiritual (non-religious) enterprise dedicated to the greater good. We are committed to helping others find understanding, healing, and connection while opening doorways to higher consciousness, love, creativity, and peace for all. Won’t you join us? Subscribe to our Mesa News email newsletter to receive updates and reminders about our great classes and events at The Mesa Creative Arts Center. Your email address and personal information will never be shared. The Mesa Creative Arts Center and Mesa Healing Center as a place of awakening for art, healing, and spiritual expansion.